With eyes wide open, Aura surveyed his surroundings. His tangled tail, black as soot, was swishing to and fro in anxious wonder. He’d never been touched. He was gathered last fall, in Wyoming, during a roundup of his herd. He belongs to the Bureau of Land Management, and his future is uncertain. Anna Twinney knows she can’t help every mustang caught in the unfortunate web of population control of the wild herds in North America. Her effort is as steadfast and sure as the mustang’s iconic image in the American West. The BLM’s herding process is a traumatic event in the life of a mustang. Anna works one on one with a group each year to help aide the transition. Ohanzee found a home, but his five herd mates still wait. Horses are prey animals, meaning they are hunted in the wild by natural predators. Given the round up process, “man” falls squarely in the predator category. The horse’s reaction to being preyed upon is to either run away (generally the first instinct) or to fight. Often times, newly gathered mustangs are put in to holding pens from which they cannot escape. Given that they can’t employ “flight” all that’s left is “fight”. Because of this circumstance and the disrespect and ignorance in how the horses are treated, they react as nature equipped them to do and then they are often branded as “crazy” or “dangerous”. While all horses have this innate response to fear or danger, the mustang’s reaction times are in milliseconds; in the wild, it’s the difference between life and death. This is why ROTH is dedicated to working with the mustangs each year and also why Anna created the Whispers from the Wild Ones DVD. To learn more about what the American Mustang has to teach us and to understand their plight, please visit https://youtu.be/aBI-VGNZBgY to watch the trailer for Whisper to the Wild Ones! To meet Augustus, Mr. Dean, Downtown, Blackjack and Aura please watch our video below. Meet the mustangs adopted and still available. 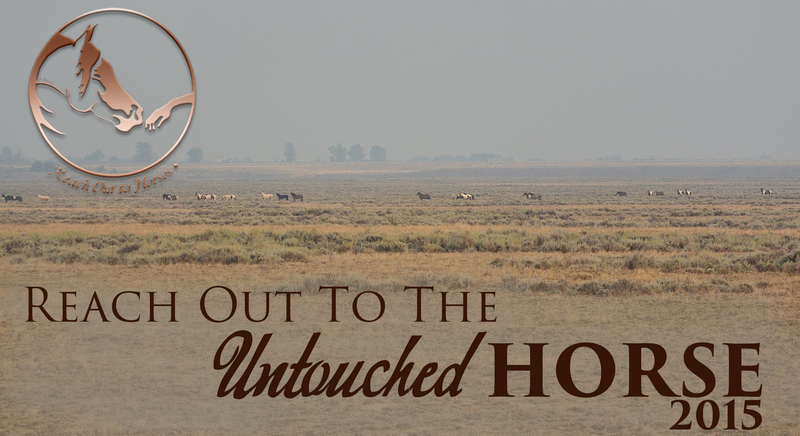 If you are interested in adoption, please email us at info@reachouttohorses.com. Previous postJoin Anna at the White Stallion Ranch in Tucson, AZ for a week of animal communication! Next postOh Baby! Meet the 2015 Foals!